Balti is a British-style one-pot curry and they say its originated from Birmingham. But to me Balti is a fusion of spices (mostly Indian) in a rich tomato- yogurt curry. 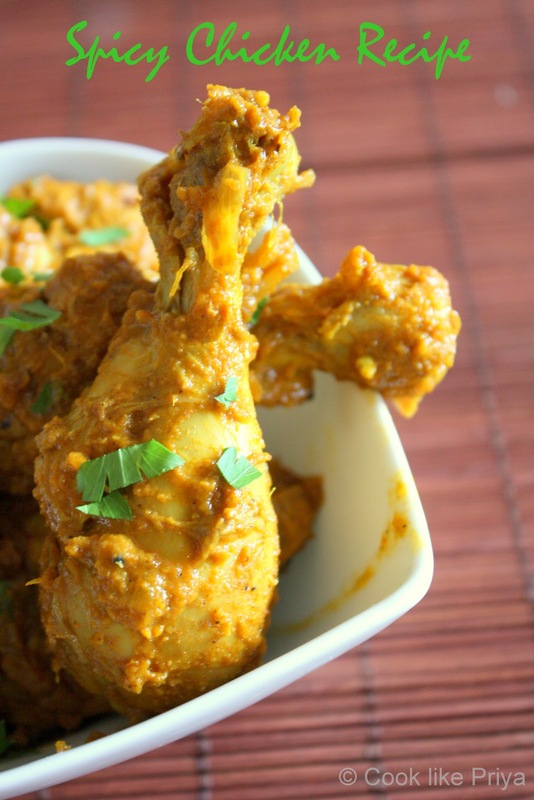 Well this chicken balti is sure to have a spice route with lots of green chilli's and replace red chilli powder with paprika and is guaranteed to fill your house with a wonderful aroma and a sure tickle to your taste buds. If you are someone who does not fancy much spice simply reduce the addition on green chilli's. In a heavy bottom vessel/ kadai heat oil. Add the mustard seeds and once they pop. Add bay leaf, onion and green chilli's and cook over moderate flame until the onions are well browned, stirring every 3o seconds for 6 minutes. Careful not to burn them too much. Add the chicken and stir it in the thick masala for a few minutes. Add enough water until it comes to halfway up the chicken. Bring to boil and cook for 7-8 minutes. Adjust seasoning based on your taste and add the lemon juice if you find your curry to be less tart. - The important stage of making this curry is frying the onions brown and reducing the puree in moderate heat and them increasing heat, later adding the chicken and water. Welcome back, Priya.. Hope you had a fun filled trip.. Chicken curry looks so tempting and delicious.. 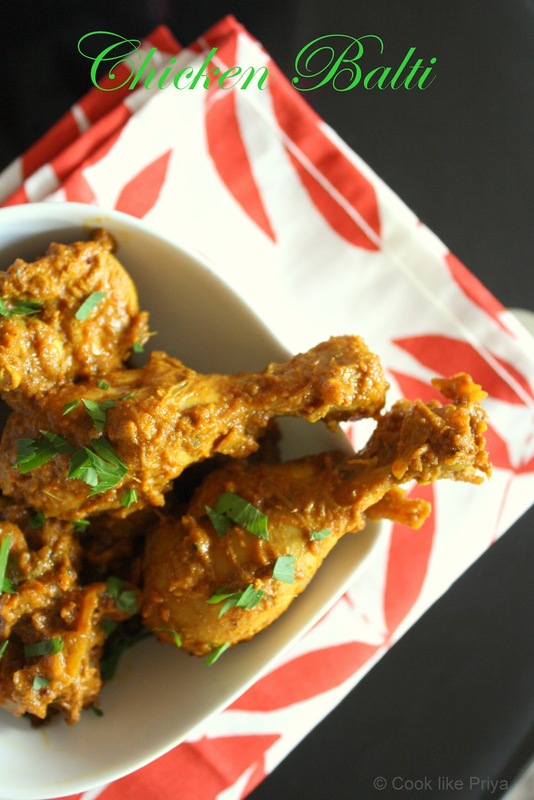 Very inviting..
Slurp, mouthwatering here, such a tempting chicken curry. Devo farti tantissimi complimenti perchè le foto rendono benissimo l'idea!!!!! Tanti baci e a presto!!!!!! have never heard about balti but I love the concoction! Looks irresistable dear...Yummy and tempting chicken preparation.. 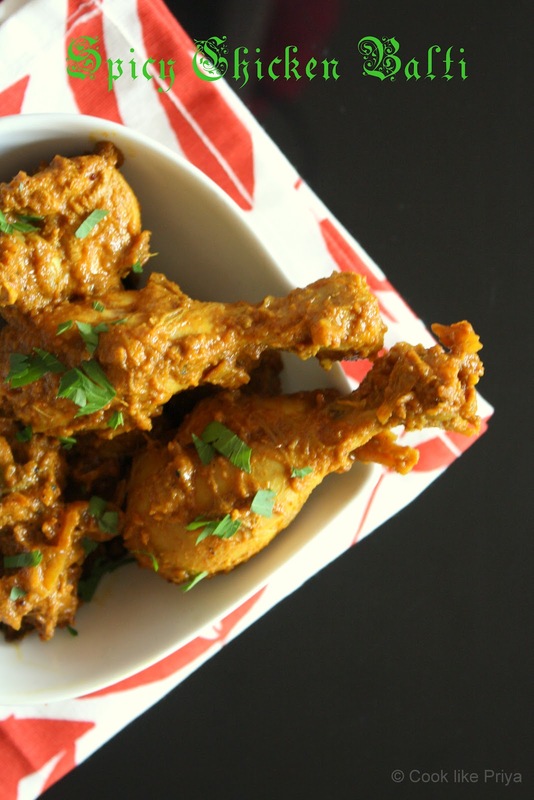 Very delicious recipe Priya. 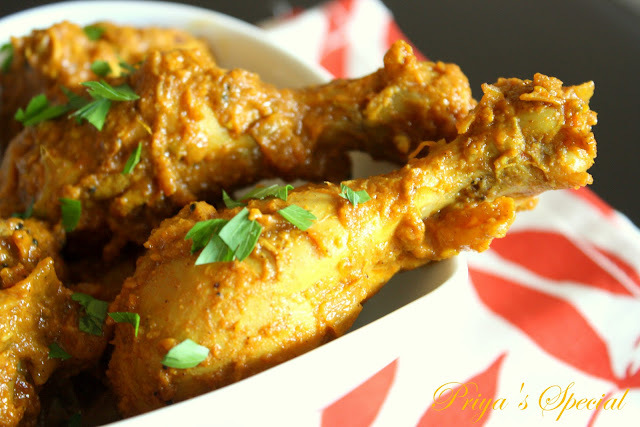 Yummy best for chicken lovers. Want to grab a drumstick .. looks very very inviting! Wow! Your chilli chicken balti is calling my name! Yummy!